I would like to take this opportunity to say how delighted I am with the work carried out by Mark Hawkins of Hawkeye security...he installed a remote control alarm system for my new residence...it is easy to use and I feel safe and secure. He is very professional and I feel confident in his work. I will be recommending Mark to all my friends. Just a few words to thank you for looking after my house alarm once again. As we grow older the alarm seems to be an important part of our life and feeling of well-being. Strange as it may seem, the alarm is more important to my wife and when we are in the house as opposed to being out. It is the security of knowing no one is creeping around the house when we are sleeping I suppose. Well as I said, just a few words of pure delight to know our alarm will look after us for another year, and by the way, thanks for finishing off my Christmas cake, it usually lasts until about March! I would like to thank Mark for all his help in supplying and fitting the alarm in my home. He fitted it in order that we could have peace of mind before we went away for the Bank Holiday weekend following a string of attempted break-ins in our street. My mother-in-law while staying in the house has set the alarm off twice lol, and I'm sure it has gone straight to Mark's phone, I can only apologise. 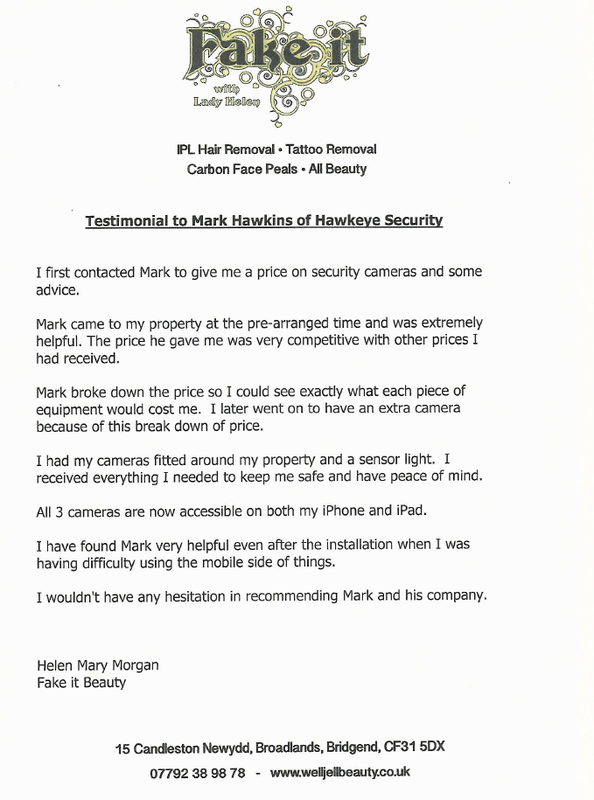 I would have no hesitation in recommending Mark and Hawk Eye Security to anyone looking for an alarm and security cameras, a first class service, he goes the extra mile. 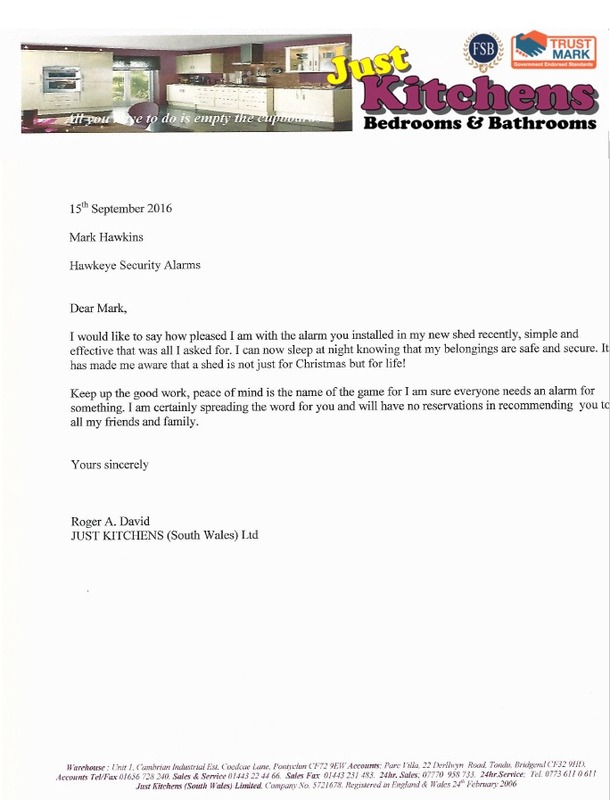 I would like to express my thanks and gratitude to Hawk-Eye Security Systems Ltd. They came highly recommended and after the initial phone call were prompt and professional and explained everything that we required to protect our depot and out buildings. The products recommended were of high specification and the installation was handled in a professional manner, even accommodating us on a weekend when all the staff were not on site. Since we have had the CCTV systems installed we have had 2 incidents where we have had to use the footage from the CCTV systems and Mark has attended to help us recover the footage we needed to catch the offenders. We would as a company highly recommend Hawk-Eye Security to others for their professionalism and expertise. Just a quick line to thank you for the fast, friendly and professional job you undertook at my house. After our burglary my wife was very upset and did not feel secure at all in our house after the scum bags had been through every room in our house and stolen a lot of cash and most of our electrical goods. The local Policeman who attended after the burglary recommended you as you had just fitted an alarm at his house. we rang you on the Monday and you popped in on the Tuesday to give us a price which was very reasonable, and you could see the state my wife was in so you managed to fit the alarms for us on the Thursday, for this I cannot thank you enough as I know you had to juggle your jobs around and probably ended up working late that night as a result of squeezing this job in for us. As far as I am concerned your customer service, friendliness, prices and professionalism are outstanding and I will not hesitate to recommend you to everyone I know for their security needs. Once again thank you. The committee and members would like to thank Mark from Hawk-Eye Security Ltd for all his help and advice and the subsequent installation of our CCTV. Having experienced countless amounts of fly-tipping and some unsociable behaviours during 2015 it was decided that some form of protection for our members would be required. Mark visited our site on two occasions and was able to pinpoint not only the correct installation angle, but has been able to supply cameras, that allow vision at night for up to 30 metres away, meaning we now have all our access points covered 24 /7. 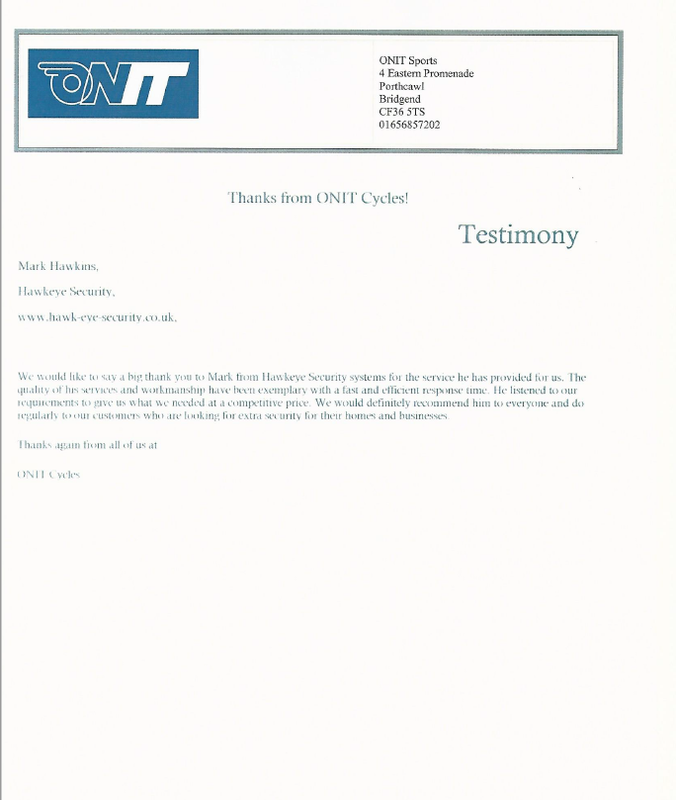 We cannot thank Mark enough both for his professionalism and his patience while the funding was secured and will certainly recommend him to anyone who is looking for Security Cameras.